It’s been a big week in Greater Sudbury for Maley Drive watchers like me. Back in September, our municipal Council asked staff if it could review certain documentation which had previously been brought forward to past Councils which those Councils then used to support prioritizing the Maley Extension as the #1 roads project in the City. Council also asked for a Cost / Benefit analysis of the project. On Tuesday night, a 57-page documents package was tabled for Council’s review. This 57-page included a new (October 29 2015) Cost/Benefit Report prepared by economists working for the Engineering/Design firm AECOM (see: “Request for Recommendation – Maley Drive Extension and Widening Project,” City of Greater Sudbury, November 3, 2015). 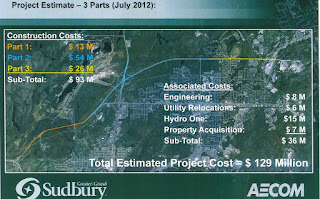 Along with concluding that the monetized benefits of Maley would outweigh the capital costs based on AECOM’s analysis (which I provided some initial thoughts on here – see: “Some Initial Observations on the New Cost / Benefit Analysis for the Maley Drive Extension,” Sudbury Steve May, November 3, 2015), there were a few unexpected alligators wading around in the weeds – including a further phasing of the project. 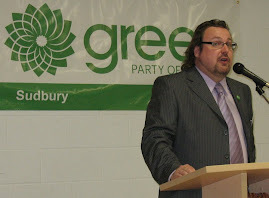 Today, the Sudbury Star is reporting that Mayor Brian Bigger was “not aware of phase two” and that “he admitted ‘there may be completion to a different length of road construction that would add up to more dollars’" as well as supplemental elements that could drive up the price tag.” (see: "Maley project feasible: Report," the Sudbury Star, November 5, 2015). In other words, City engineers have cut back on the scale of the project while nobody was looking. In a blog of mine from earlier this year (see: “Taking a Closer Look at Maley Drive, Part 1: Costs,” Sudbury Steve May, April 21, 2015), one of the things I looked at was how the scale of this project has shrunk in size over time, as costs have risen. Back in 2009, the City uploaded a pretty cool video of the Maley Ring Road project to YouTube. At that time, a four-laned Maley Drive was planned to link MR 35 (Elm Street) in the west to the intersection of the Kingsway / Highway 17 in the east. However, it was understood that the eastern portion of the ring road – that part from Falconbridge road looping southeast to the Highway 17 by-pass – just wasn’t feasible at present. Instead, funding applications were applied for to senior levels of government only for that portion of Maley between MR 35 and Falconbridge. Also in 2009, in a report dated April 23 2009, prepared by Greg Clausen, General Manager of Infrastructure Services, Council was urged to submit the Maley Drive Extension project to the federal Building Canada Fund. Successful applications under Building Canada would see costs shared between federal/provincial/municipal governments at a rate of 1/3 each. Total project costs weren’t identified in this report, but the report indicated that the City would be on the hook for $41 million in total – which includes the City’s 1/3 share along with other “ineligible” costs. On January 12, 2011, Council reconfirmed its commitment to Maley Drive after reviewing a report dated January 6, 2011, prepared by Robert Falcioni, Director of Roads and Transportation Services. In that report, we discover that the total 2009 costs for Maley Drive were estimated to be $115. What’s not clear is whether this amount also included “ineligible costs”. There is no reference to the amount the City applied for through Building Canada. What was the “entire” project in August 2012? Resolution CC2012-289 refers to a report (also included in the previously linked 57-page documents package) dated August 8, 2012, prepared by David Shelsted, Director of Roads and Transportation Services. This August 8th report outlined a project costing $129 million, whose scale consisted of a 4-lane road from MR 35 in the west to Falconbridge Road in the east. That report also identified that the City had been committing funding for the Maley project from the Capital Roads budget since 2008 for its anticipated 1/3 municipal share. At this time, the project was broken down into 3 parts. Part 1 – between MR 35 and Lasalle - $13 million. Part 2 – between Lasalle and Barrydowne - $54 million. Part 3 – from Barrydowne to Falconbridge - $26 million. Together, these 3 parts totalled $93 million. An additional $36 million was set aside for property acquisitions, utility modification/relocation and engineering & design. Total price tag: $129 million. The report indicated that costs had increased by $15 million since 2009 – but it doesn’t say anything about “ineligible costs”. The 57-page document bundle tabled to our current Council earlier this week doesn’t include a copy of the application made to Building Canada back in 2009 – but we might be able to deduce that total eligible costs were $80.1 million, based on the provincial commitment to fund its 1/3 share - $26.7 million (see: “Province vows to ‘fulfil’ Maley funding promise,” the Northern Life, December 2, 2014). Let’s do some quick math. If total eligible costs were $80.1 million in 2009, and the total project costs were $115, that means that “ineligible costs” would have been $34.9 million – call it $40 million. In 2009. What might have those “ineligible costs” have been? Initially, I thought maybe they would have been those additional costs identified in the 2012 report – the $36 million for property acquisitions, utility modification/relocation and engineering & design. The numbers are close – so maybe that’s what they were for. A lot of those costs would have to do with challenges related to existing infrastructure along Maley between Lansing and Falconbridge, where a rail crossing would need to be upgraded, and where electrical transmission lines and other utilities may need to be relocated. Interestingly, that’s one of the areas now that is being left out of the current Phase 1 project. Whoa. Hold on a second there. I think it’s fair to say that Greater Sudburians, including our Councils – current and past going back to the one headed by former Mayor John Rodriguez – have been under the impression that the City would be on the hook for just slightly more than our 1/3 share of the funding. Back in 2009 at the time of the Building Canada application, total costs to the City were estimated to be just $41 million – or about $14.3 million more than our 1/3 costs. And that was for a project which ran between MR 35 and Falconbridge. And now? Well, for the same project between MR 35 and Falconbridge, now split into 2 phases, it looks like the City will be on the hook for our 1/3 share of the Building Canada funding - $26.7 million for Phase 1– PLUS an additional $50 million (or more) for Phase 2. This doesn’t look to me like what the City has signed up for – or what our previous Councils signed on to. What we’re going to get out of Building Canada is a much smaller project – one which will see Maley extended between Lasalle at College Boreal to Barrydowne, and widened between Barrydowne and somewhere just east of Lansing. At the east and west ends, traffic will merge into one-lane roads. That wasn’t a part of the original plan. At no time in the past has such a stunted plan been considered by Council. No recommendation has yet been prepared for our current Council’s consideration regarding this stunted Maley Drive project, but certainly the AECOM Cost / Benefit report includes a recommendation that Greater Sudbury pursue the Phase 1 initiative. I expect that Council will be asked in the near future to endorse this scaled-back roads project. The Environmental Assessment - Still Relevant to a Stunted Project? Council should be very careful how it proceeds. The Sudbury Star also reports today that the approval of the 2006 Environmental Assessment (EA) for the Maley project runs out in 2016, so construction has to begin within the next year. Here’s the problem with that: no doubt the 2006 EA contemplated a more, shall we say, “robust” vision for Maley – and not the stunted stub that we’ll be getting for our money now. Given that the scale of the project has been significantly altered, does that 2006 EA still have any relevance? The assumptions under which it was prepared are not the same as those of the current project. Council ought to take a very close look at the EA and assure itself that the approval remains a good fit. It’s not just that the ends are being cut off of the project, but certain transportation infrastructure – including roundabouts at Montrose, Barrydowne and Lansing, are being removed from Phase 1. In the currently unfunded Phase 2, the City will go back to those three intersections, tear up what they had previously laid down, and re-engineer them with roundabouts. I understand that if this never happened, it would please a large part of the community – but keep in mind that those roundabouts were being considered for environmental reasons, and to relieve congestion. If you take them out of the project (as is being done), you’ve changed the underlying EA assumptions. Ultimately, what is clear is that our Council is going to now be asked to endorse a Maley Drive extension project which was not the same as that which went through the environmental assessment process, the Building Canada application process, and which received support from two previous Councils. Council is going to be asked to approve something new – something smaller and less robust than what has been contemplated at least since 2006. It’s something which will not meet the current expectations of Greater Sudburians, and may not meet the expectations of senior levels of government who were asked to foot the bill for a more complete project. It may not meet the regulatory tests of the Environmental Assessment Act under which a larger project received approval. Even those in favour of building Maley Drive (of which I do not count myself) ought to urging our Council to proceed here with caution given all of the above. Council could easily find itself in legal hot water with regulators, and in a political mess with project funders and voters. All for a roads project which – in my opinion – we don’t need and can’t afford, for development which isn’t expected.